You are here: Home / Church Talk / Can we save Christian Education from itself? This is a mind-reeling video by Sir Ken Robinson, a Brit, who speaks about the failures of our current public education system and how we can change our approach from the factory-based methodology of the past to a more collaborative approach of the future. Is our Christian education paradigm about production and conforming? 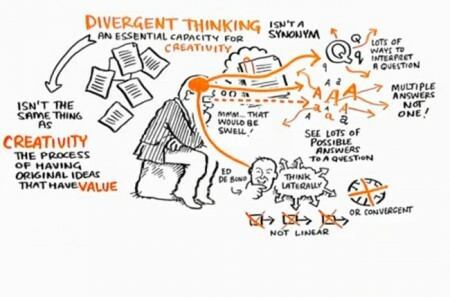 Do we encourage divergent thinking or do we push people towards a particular answer? How might the Church better embrace the arts as they are the casualties of this current problem? Here’s the video below (and the transcript is here if you can’t watch it at the moment). Take a watch and respond! I am the daughter of a professional Christian educator. The main barrier my mother experiences in her work is that people (United Methodist adults) do not believe that children have the capacity to interact with the Divine. They ask children to repeat prayers after them, not giving children the chance to formulate their own prayers. They sit them down in front of VeggieTales with snacks, including the ubiquitous Red Punch, and then wonder why the children run amok, all the while calling it “children’s ministry”. They give the children Sunday School “curricula” that largely involves crafts and other activities that are soon thrown away or eaten, and then wonder why children are not engaged. When Mom says that children can read the Bible and pray and think about the things of God, the adults are uninterested. It’s time to stop giving our kids the spiritual equivalent of sugary breakfast cereal and allow them to experience the real thing. Experience with the Living God is what will keep them coming back to church, not programming or rock concerts. I feel like I’ve heard the argument that education shouldn’t be separated by age several times recently. I’m curious how it would work in church circles. I mean, to some degree, we do it already with classes grouped in several ages together. But we still separate out early elementary, late elementary, middle and high school classes. When do certain ideas or topics become too big for an age to handle? When is it beneficial to separate and when is it harmful?